Welcome to your second assignment! This week we are going to create a table scene like the one above, it can be breakfast, like I’ve created or another meal if you want. 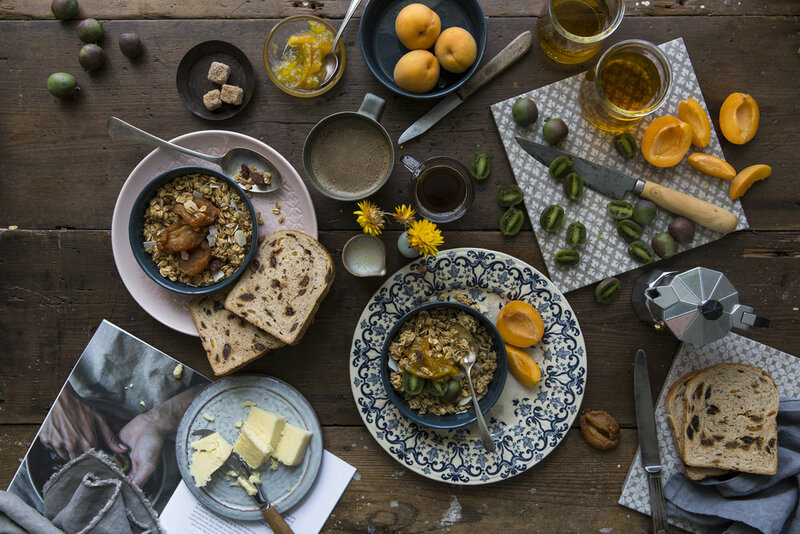 The reason I’ve picked breakfast for the assignment is because I don’t want you to feel like you have to cook something as well as try and create, style and photograph! Sometimes for practise it’s ok not to try and do everything. 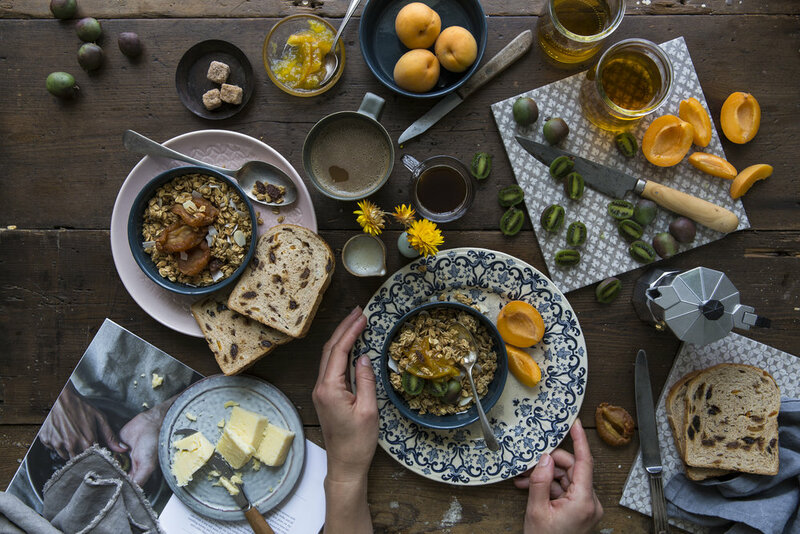 Breakfast is pretty and a joy to style whereas dinners get cold or oily very quickly and can make the process frustrating. However if you want to cook and style then please do! I did this as a landscape but if you want to do a portrait version that’s ok too. I’m going to walk you through how I created this and then set your assignment at the end. But first you can watch a stop motion from my prop selection to the end image. Colour Wheel: I knew I’d be using apricots and yellow tones of the dried pears and apple juice so I pulled out blues and greys for the props. So the main starting point was complimentary colours of yellows and blues and various tones of these. 1. I had my story in mind and had done my food shop. I planned to create an easy, healthy, lazy breakfast, adding fruit to granola, drinking coffee. I wanted it to feel warm and cosy so I knew I was going to use the wooden table top and I also wanted some pops of warm colour so had the apricots but when I was shopping I found the mini kiwi berries and thought they looked interesting and fun and would work well with the blues I wanted to use. I went through my props and picked out everything I thought might work. Laid it all out near the scene (after taking this photo!) It’s easier to have everything to hand once you start styling. 2. I like the layering of these two plates (see the prop image) and instinctively I’ve placed it on the rule of thirds bottom horizon line. I dressed the granola with dried pears. Love their shape and how they create interesting shadows. 3. Adding elements. Just start placing things down, I usually do this instinctively but notice how things are grouping into 3’s, this gives flow and balance. I have also used two of the dark blue bowls to give balance but by layering with the larger blue plate, it’s subtle. I’m using the tile as a make shift chopping board, adding the kiwi berries, some whole some chopped. I’m keeping all my angles slightly different, like the spoon, knife, handle of the cup as well as the angles of the tile edges. 4. Now the faffing begins! I decided, to try swapping the main focus from the granola on the patterned blue plate, to fruit toast. And added the Granola with Pear to the pink plate. Next I started add the apricots and working out how to add those pops of colour naturally into the scene. 5. I continued adding layers and building the scene, filling the empty bowls and plates, adding glass to see how the reflection works. TIP: If you have translucent liquid in a glass in your image, try placing it nearer the light and you’ll get a little glow through it and that reflection of coloured light is really nice. 6. The scene is really coming together now. I’ve changed the white cup as that white rim was really jarring my eye and drawing attention to it instead of blending in. I’ve add a little magazine and layered that with the cheese ‘board’, marmalade is in the glass pot near the window for reflection and the orange - rather than red jam - blends into the scene nicely. Coffee is in the cups too but I’ll add the froth in the large cup for the end shots. 7. This is my final image. I swapped the granola back to the blue patterend plate (I told you I faff a lot and for me only by going through this step by step process do I get to the final image! And created a fruit toast station in the bottom right corner. I softened the magazine by adding linen. Swapped one of the espresso cups with the milk jug. Added some little florals, that fit the yellow/orange theme. And then finally added detail to the top left corner. Granola sprinkles would have been too white but the darker sides of the kiwi berries, blend in without drawing attention however that detail and texture balance the image. Phew! I could leave the image here, I’m really happy or add some hands, so that’s what I did. 8. This is where a tripod comes in so handy! Use the timer on your camera to take the image if you don’t have a remote control. Or if you don’t have a tripod ask someone to model for you. I hope you can see the construction of the image, how grouping things in threes really helps the scene look really natural. Layering and using tonal props again help things look natural. Gaps between things are irregular, and angles of straight objects are slightly different to each other so there’s no obstruction to the flow. Adding the hands helps make the patterned plate the hero plate. Don’t be afraid to move things and swap things, even if you end up going back to your original idea it’s good to experiment, particularly if the images is becoming a struggle and you are getting frustrated. Also sometimes with a busy scene like this, walking away for 5 minutes and coming back may help highlight any ‘problems’ something you didn’t notice before but now seem glaringly obvious, like all the handles of the cutlery being set at the same angle for example. So now over to you! Before you even take a picture, go through these set up steps. Gather your props and food that fits your self imposed brief. Place your background (be that table, tile, wooden surface, linen table cloth) adjacent to your side light. Remember we are using natural side light, this means the light will come in from either the left or the right and fall off causing shadows on the opposite side of the light. Set up your camera, if you are using a tripod (which if you can it will make this process so much easier and quicker.) You can decide if you want to shoot portrait or landscape but we are doing an overhead image. Props: Choose your props according to your story, but remember texture and layering and avoid laminate wood or shiny surfaces.